My father, E.M. Donald (Don) Cleveland, a proud VC graduate of the Class of 1937, was an introspective man with unshakable faith. Dad was raised in a deep-rooted Catholic family and his parents were founding members of Sts Peter and Paul Parish. My father told wonderful stories of his time at Vancouver College and had fond memories of his peers and the Christian Brothers. He excelled in all subjects ranging from the humanities to the sciences, and upon graduating he pursued his Bachelors and Masters at UBC and his PhD in Bacteriology at McGill University. He went on to work for Deer Lodge Hospital, a federal Veterans Affairs Hospital, for over 30 years. My father left behind a legacy as a man of character and faith. Two of his nephews also attended the College and now I work at VC. I keep my father’s class picture in my office and feel his presence as I walk through the same campus that he did so many years ago. I support the Our Next Century Campaign as a tribute to my father and to commemorate his legacy at Vancouver College. Our family is supporting Our Next Century because we believe Vancouver College is “Our School for Life”. 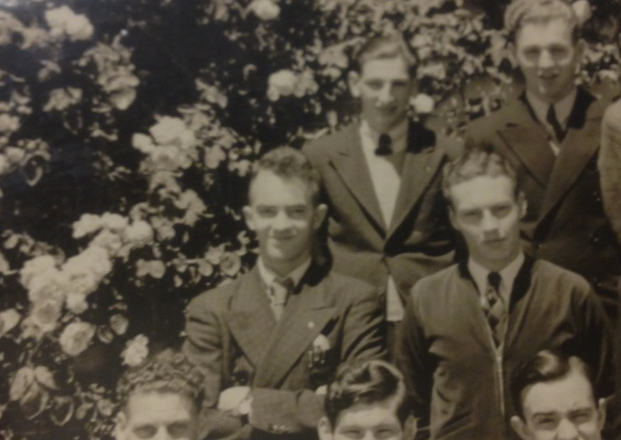 Our Dad, Ian H. Stewart, attended Vancouver College in the 1940s, graduating in 1950. His life was positively impacted by his time here at College. Now his grandsons, Max Cameron (VC'18) and Will Dunn (VC'22) are benefiting from the legacy of those who came before and built this school. As the school reimagines itself for the next century, its promise to graduate men for our times will require more than ever excellence in academics, athletics, service and tradition. By supporting Our Next Century, we hope to pay this promise forward so future generations of VC students will enjoy the same benefits as our Dad and our sons. Our Dad was born in Hankow, China in 1932. He was the third generation of a large Scottish, Catholic family living in China since the mid 1800s. In the summer of 1940, Dad’s family was evacuated from Hong Kong and came to Vancouver to wait out the war. After settling his family, Dad’s father, Hugh Grant Stewart, returned to Hong Kong to join the Hong Kong Volunteers Defence Corps. In December 1941, Hugh was captured at the fall of Hong Kong, and spent 4 years in a Japanese prison camp. During the war, Dad lived in Kerrisdale with his mother, Hedwige, his sister, Pat and brother, Ron and his Aunt Madeleine and her son Noel. The family received scattered news from his father and other family members displaced by the war. They had to lean on their faith that he would be safe and would return home. It was a tumultuous time for Dad and it made a significant impact on the person he would become. It was at this time that he and Ron were first enrolled as junior boarders at Vancouver College, Dad in Grade 4 and Ron in Grade 3. Pat attended Little Flower Academy. At Vancouver College they made many life long friends, had plenty of adventures and found themselves in a bit of trouble from time to time. Thankfully they could both turn on the charm to ease themselves out of sticky situations. After the war, Dad’s father was repatriated to Canada and the family reunited in Vancouver. Although they dearly wished to remain here, career and responsibility called and in 1946 the Stewarts returned to Hong Kong, so Hugh could resume his career at Caltex. In July of 1948 while returning from a business trip to Macau, tragedy struck when Dad’s parents were killed in the first high-jacking of a commercial airliner. The children – Pat 17, Ian 15 and Ron 13 – were sent back to Canada to live with family. The boys returned to Vancouver College as senior boarders to complete their schooling. Having been orphaned and displaced from their life in China, Vancouver College became their home. It provided them with guidance, discipline and support at a time when they needed it most. Although not a natural athlete like his brother Ron, Dad threw himself into sports and enjoyed the camaraderie of his teammates and the mentoring of his coaches. This love of sport remained with him and became an inspiration throughout his life. Dad graduated from VC in 1950 and attended UBC, earning his law degree. He played football and became a member of the Phi Delta Theta fraternity and in 1957, he was drafted to play for the BC Lions. He was called to the bar in 1960 and served over 50 years as a member of the Law Society of BC. 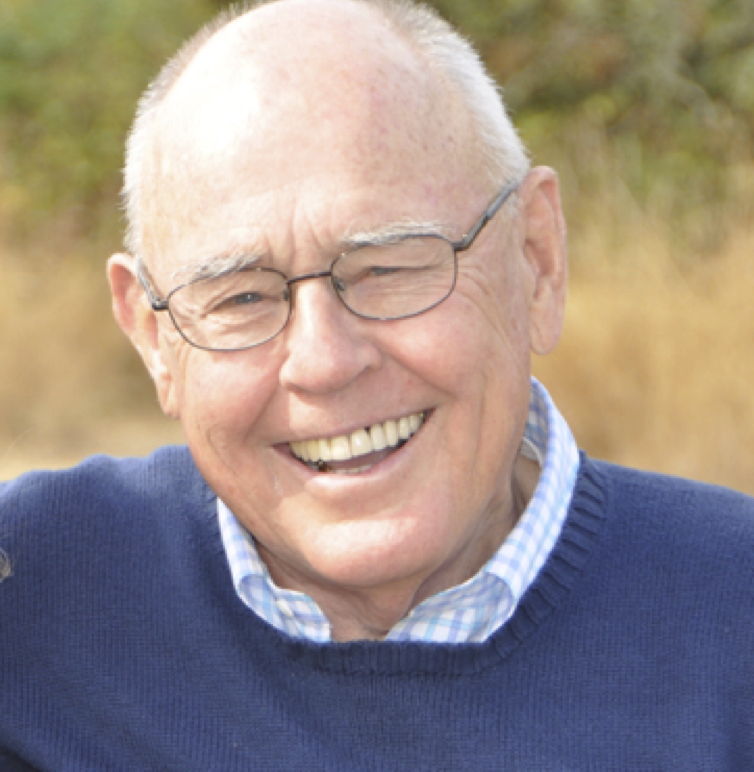 He settled in Victoria where he worked as a lawyer, advisor to government and many well known Canadian corporations before going into private business as the owner of Victoria’s only Honda dealership. In 1966 he married our lovely Mum, Gillie, and they moved into our family home in Oak Bay to raise their family. Victoria became his new home and he used his skills to help strengthen the community where he could, most notably at the University of Victoria. In 2013, our parents decided they wanted to be closer to our families, so they sold our family home in Victoria and moved to UBC. At that time, Dad’s eldest grandson, Max Cameron, was a grade 8 student at Vancouver College. Dad loved to come and watch Max play football and relive his time at VC. Tales of streetcars, climbing apple trees and baseball games were his favourites. 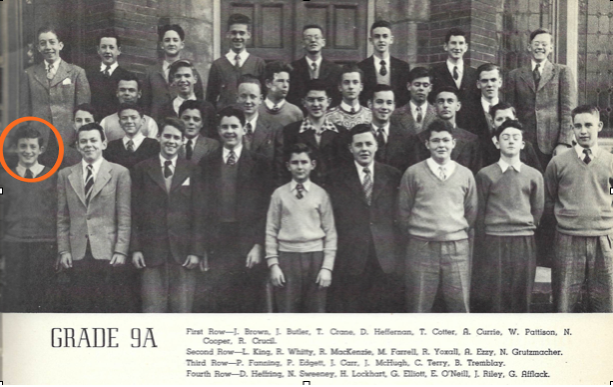 He also had many fond memories of the Christian Brothers that taught him over the years, some tough lessons that built character but also an overwhelming sense of belonging. In November 2016, Dad was inducted into the Vancouver College Hall of Honour for his contributions to the business community. He was nervous before his speech, but as we have seen time and time before, once at the microphone, sharing tales of happy days, it was hard to get him to sit down. Dad passed away in June 2017 but not before learning that his second grandson, Will Dunn (2022) would attend Vancouver College in the fall. He was happy that he had taken the “right track” and had hopes that his youngest grandson, Sam, would one day follow in the family tradition. Vancouver College provided a strong foundation for our father’s life. He leaves behind an incredible legacy – in business, community service and philanthropy. His time at College solidified his faith and helped him to become a man for our times. We hope that through our support of Our Next Century, Vancouver College will graduate more men like our Dad; men of substance, character and faith who will strive to make a positive difference to our community, province and country. The legacy of Vancouver College and its traditions live on in our family. 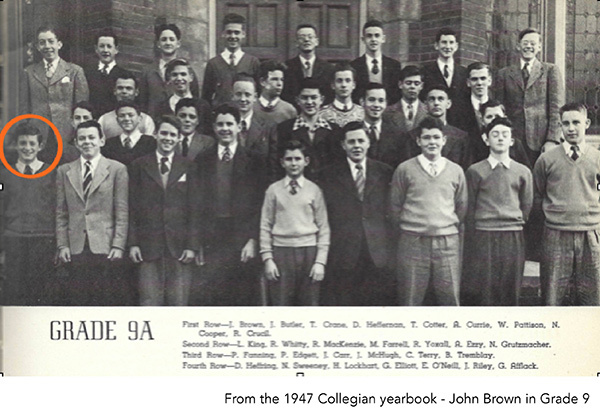 My father, John, is an alumnus from the class of 1950. My mother, Janet, was one of the first women on the Board and served as its Chair in the 1980s. 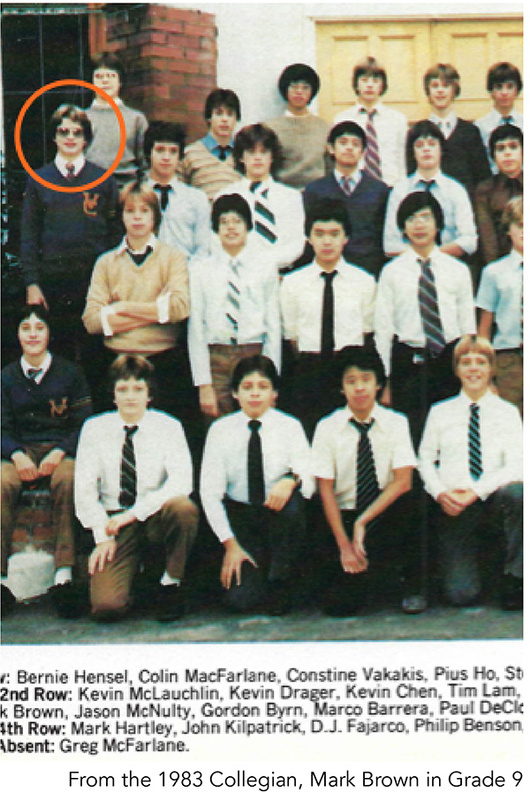 I was a 12-year man and graduated in 1986. And now my wife, Susan, and I have two sons who have been here since Kindergarten, Matthew in Grade 9 and Scott in Grade 10. When my father went to school here in the 40s, he attended classes in Lannon and McCormack Halls. By the time I was here in the late 70s and 80s, there were four “halls” and the Alumni Gym. Blessed Edmund Rice Building for Senior students was built in 1991 followed by the Holler Family Science Centre in the mid 2000s. 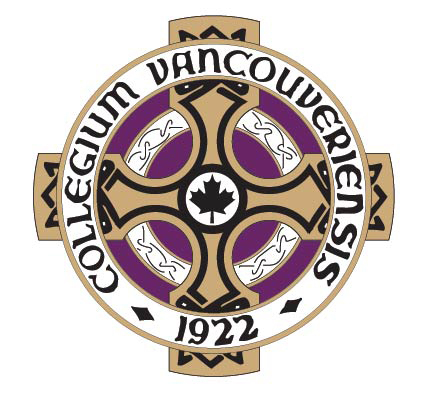 Since the school began in 1922, the Vancouver College community has always rallied together for the greater good of the school. The whole education and well-being of our boys, which includes their learning environment, have always been in the forefront of all that we do as parents of this great school. Now, it’s our turn. We are looking ahead to the next 100 years of Vancouver College. We need to replace the ageing, seismically challenged buildings with newer ones to keep the students safe and educate them in modern facilities. We are benefitting from the facilities built by the families before us. We too need to do our part for future generations – perhaps your grandson will be part of that next generation. Susan and I joined other families and committed a five-year pledge to the Our Next Century campaign. We gave to the best of our ability for Matthew and Scott, for all the boys at VC, and for the thousands more who will be here in the future. On behalf of the Board, Administrators, Faculty and students, thank you to the families who have already given or pledged to Our Next Century. Susan and I, and other members of the Campaign Cabinet, are here to help families with the process if you are either new to our community or still considering or unsure about giving. We would be more than happy to share our personal experience and why we choose to support Vancouver College. Thank you for your support. We need everyone’s commitment to help us continue the tradition that has built Vancouver College over almost 100 years. 1. Why did you choose to send your son to Vancouver College? We came to Canada in 2005, from Ireland. Our son, Domhnall, went to St. Augustine’s school for elementary. In Grade 7, when it came time to look at high schools, there was no debate. It had to be VC. I had received all my elementary and high school education in a Christian Brothers school in Ireland. We felt that this would be the best environment for faith, academics and moral and spiritual growth for our son, Domhnall. We also spoke to many parents who had sons at VC. They were so enthusiastic; we knew it was right. 2. Is there a particular moment or event that affirmed your decision to send your son to Vancouver College? There are so many! How we have witnessed the school community rally around so many families in time of crisis and need has been so moving. It really reminded us that we are all family. While at VC, Mary’s mom passed away, and we received such strength and support from our 'football family’ in particular. Being part of the football family and seeing how the coaches and staff dealt with the boys when results maybe didn’t go their way. Teaching kids that there can be honour and pride in defeat is something our society, and I think we, as parents, could be better at. I was so impressed at how the coaches and staff used adversity to make ‘better men’. Also, working with other parents on events like Finnegan Ball is just so amazing. It is incredible how inspiring it is to be with so many parents who work tirelessly for the love of the school community. 3. What impact has being part of the Vancouver College community made on your son and your family as a whole? Our son’s life, and ours, will never be the same. We feel that we have become part of a very loving, supporting family, and we look forward to many more years of involvement with the school community, even though our son has graduated. We spoke to Domhnall about his thoughts on VC and he said that he has “made lifelong spiritual and brotherly bonds with many boys at the school”. He has grown up to be a very sensitive, empathetic, humble young man, and we have no doubt that the school is responsible for that. 4. What drew you to become a supporter of Vancouver College? This was simple. We saw all the time and energy that teachers, staff, coaches, and parents gave to the school and we wanted to be part of that giving. We saw this, and we were humbled by the dedication and commitment of others. We are blessed to be able to afford to help the school community financially, and wanted to donate to ensure that other young boys could get the same opportunities at VC as our son did. We gave of our time, at Finnegan Ball and with the football teams, because it was so much fun, so rewarding, and so inspiring to be part of the love and generosity that characterizes VC. 5. Is there a story of your time as a parent that stands out? When the boys lost in the Varsity Provincial Final to Mount Doug we all went back to the Gym at VC. The mood was subdued. The boys were tearful. No-one looked like they wanted to be there. But Coach Todd Bernett stood in the middle of the gym and spoke to each and every one of the more than 70 players on the team. He offered them words of encouragement, consolation, and inspiration. I turned to my wife Mary and said “I wish I was that good as a parent”. Thank you VC for embracing us as part of your family. We are forever grateful. As I think back on my first day teaching at Vancouver College, one thing still holds true more than a decade later – this school has always been good to me. I hold a great sense of pride and privilege working in a faith and learning community alongside colleagues who share similar values and are not afraid to celebrate them. As VC’s priority continues to shift toward collaborating with students to create a positive and safe learning environment infused with Catholic values, I am excited by the prospect of teaching in a new physical structure that will complement this focus. I’ve been happy to contribute to the Our Next Century campaign for the past three years and will continue to do so. I truly believe that what we do as teachers and staff is important to our students and community now and for the future of Vancouver College. When it came time for our son to move onto high school, we followed what seemed like a natural progression from a local Catholic elementary school to Vancouver College. A number of his friends were also moving to VC and so it seemed like an easy transition. We realized fairly early into Grade 8 that VC would provide Angus with a very different experience: mostly because it is a school that understands boys almost at an elemental level. Our child - who was always in trouble at elementary school for being too fidgety, too noisy or too physical - now seemed to fit right in. He played sports and joined the jazz band. Now in Grade 11 he still regularly regales us at the dinner table with funny anecdotes about students and staff. He is clearly part of a community rather than just a school. The school ethos of ‘leave here a better man’ and the balance between academics, spirituality, athletics and social activities resonated with us as a family. We also liked that boys were encouraged to become leaders: to coach younger students, to set an example, to encourage an atmosphere of fairness in the treatment of others, and to hold themselves accountable (no missed practices!). We chose to be a Vancouver College donor because we wanted to contribute in some way to helping another boy experience the benefits of attending this wonderful school. When Angus graduates in 2018 we know he will carry the spirit of VC with him wherever he goes. Interested in sharing your story with the VC Community? We would love to hear from you.